In August, Snickers tried lure coursing for the first time and LOVED IT. I immediately (literally, within minutes of his first three runs) started searching and emailing to find a way to get involved in lure coursing. I got really lucky. My first email was to the American Sighthound Field Association regional director for this area. Within an hour or two, I’d received a reply and we were corresponding back and forth on how to find all-breed lure coursing events. 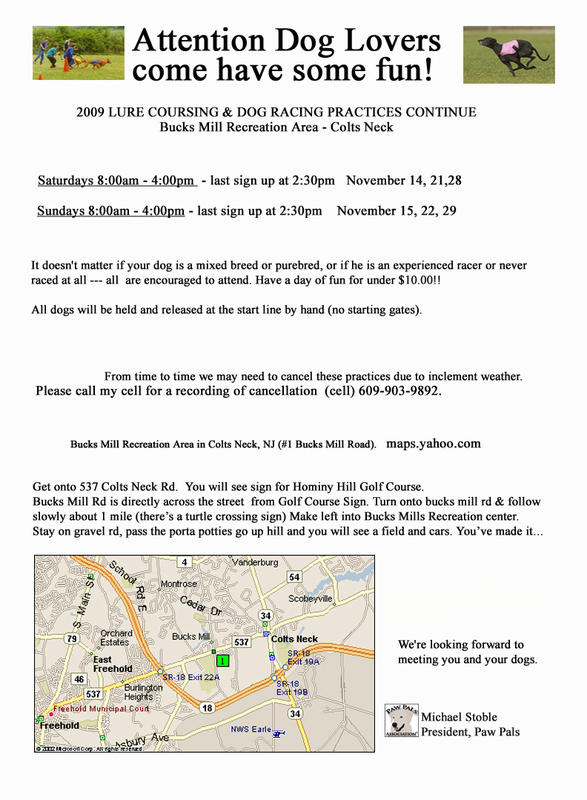 They put me in touch with Mickey Stoble who runs all-breed lure coursing practices and competitions in central NJ. So, long story not so long, Snickers and I are going out on Saturday, November 14, to check it out. Any of our NY/NJ peeps want to go with us or meet us there? Let me know. It should be GREAT! Last sign in to participate is at 2:30 PM! "It doesn’t matter if your dog is mixed breed or purebred, or if he’s an experience racer or has never raced at all, all are encouraged to attend. Have a day of fun for under $10.00!" Snick and I can’t wait to get there and try it out. Let me know if we might see you there too! Ooooh, do you think they'd help find one in Texas? They might, if they're super nice like the regional people here were! Go to http://www.asfa.org/officers.htm and check out the contact info for Region 4. Tell them you have a non-sighthound and you're wondering if they have any information on All Breed lure coursing in the area. I was so happy to find you website. After reading about two rescued Brittanys having so much fun while doing lure coursing in “The American Brittany” magazine, we thought our Brittany would love doing this. It was really depressing after searching the net for several hours without success for any events for all breeds and then I found you. Thanks for sharing this with us. The upcoming event in Colts Neck will be perfect for us to try as we live in the area!!!!!!!! That’s awesome Sandy! That’s exactly why I posted all the details… I searched and searched also to no avail. If I hadn’t emailed someone from ASFA, I never would have found this all breed group. I’m glad the info helped you and I hope your Brittany loves it as much as my Shiba does!